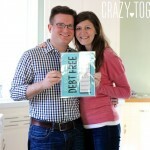 Well, it only took 14 months for us to muster the courage, but we did it! 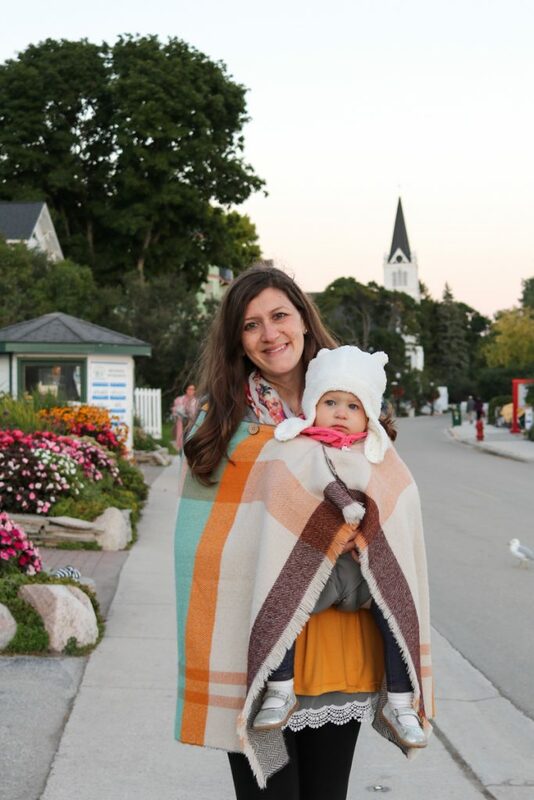 We took Dessa on our first-ever vacation as a family of three to Mackinac Island. We've had a few overnight trips the homes of friends or family members, but this was an actual, legitimate mini-vacation. The trip involved transportation by car, ferry, horse-drawn carriage and lots of walking. 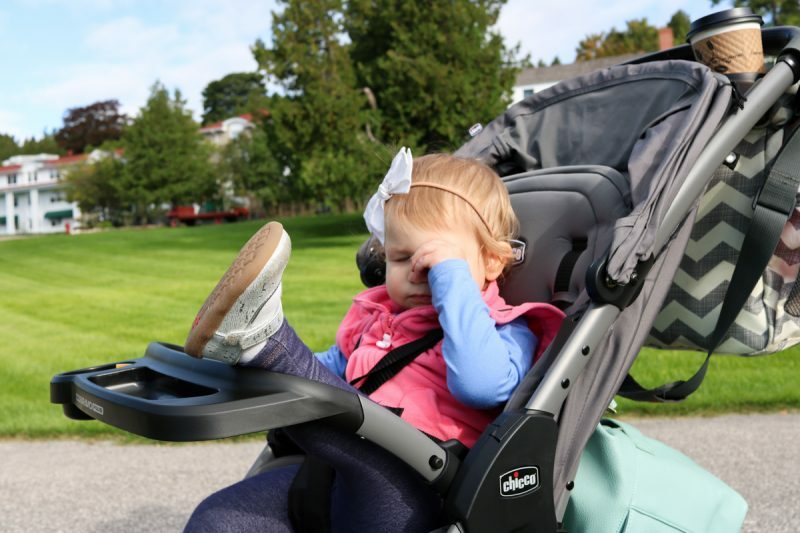 We all enjoyed our time and we are especially thankful to Chicco USA for making our walks with Dessa a breeze with our new Mini Bravo® Plus stroller. Now if only we could find an easy solution to managing a toddler in public and taking family photos. It's so much more challenging to snap the perfect photo when there's an impatient little person who just does not want to slow down for anything. 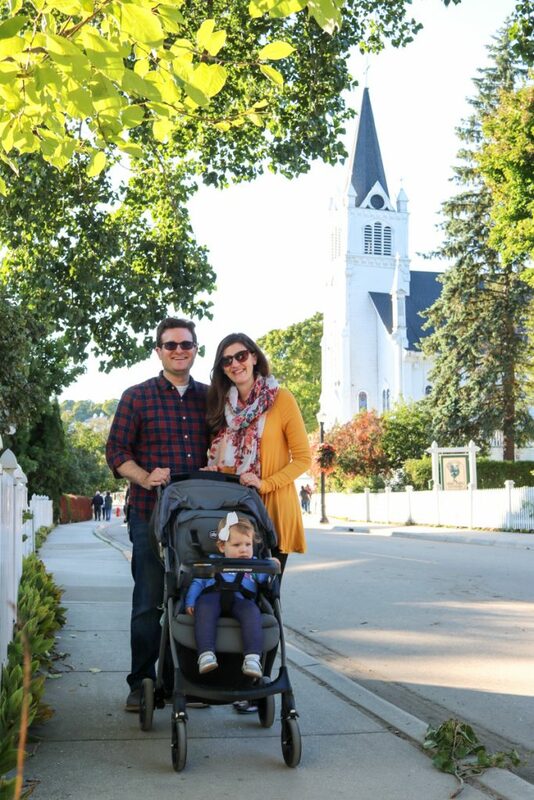 We can't wait to take you along on a recap of our adventures from Mackinac Island, crazy photos and all. This post contains affiliate links. 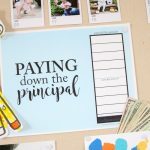 We earn a small commission each time someone makes a purchase through one of our links, which helps to support the blog and our family. 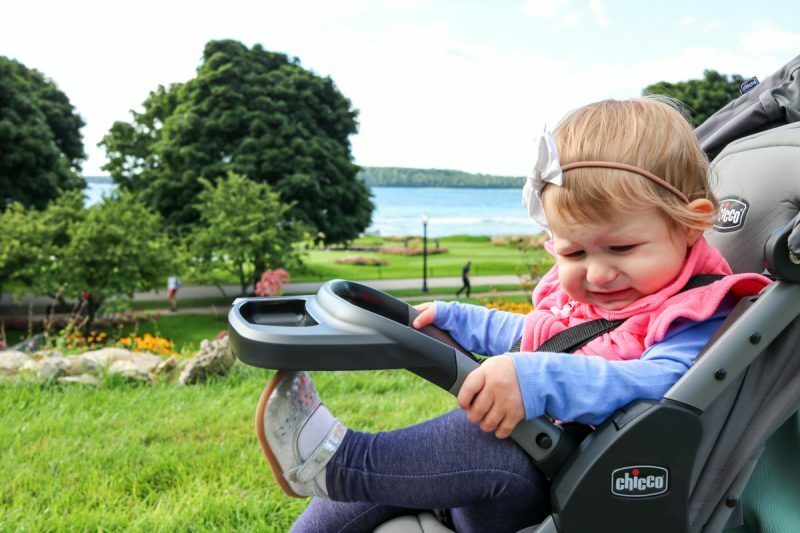 Special thanks to Chicco USA for graciously sending a Mini Bravo® Plus stroller our way just in time for the trip – which helped Dessa to travel in style with minimal effort from Mommy and Daddy as we strolled up and down the hills of Mackinac. 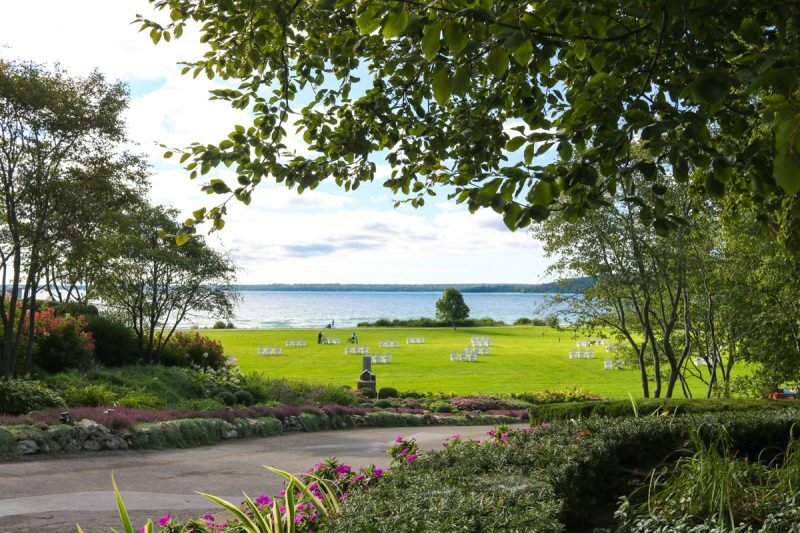 If you're not familiar with Mackinac Island, it truly is one of Michigan's finest gems. The island is located along the Straits of Mackinac, near the Mackinac Bridge that connects Michigan's two peninsulas. It can only be reached by plane or boat and cars are not permitted on the island. There are a few big ferry companies that provide transportation back and forth to the island all day long. When visitors finally arrive and step off the ferry for the first time, it feels as though you are stepping into another time. 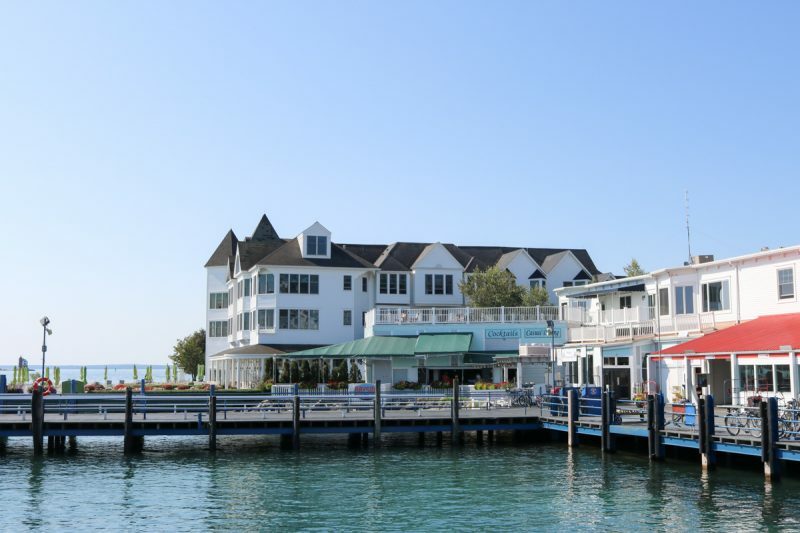 The trip from Metro Detroit to Mackinac Island is a bit of a long haul. We spent four hours in the car, stopped to grab lunch, spent a half hour waiting for the ferry, and just when we thought we were in the home stretch, things really got interesting! It was an incredibly windy day on the Straits, which made for a really rough boat ride to the island. REALLY rough. The boat hit several waves hard along the way. Rob is prone to motion sickness and he was trying his best not to toss his cookies, while I was just hoping the boat would safely get us all to the island in one piece. Dessa, meanwhile, was completely unaffected by the slamming of the boat. I wore her in our Ergobaby 360 carrier and she was as pleasant as could be! 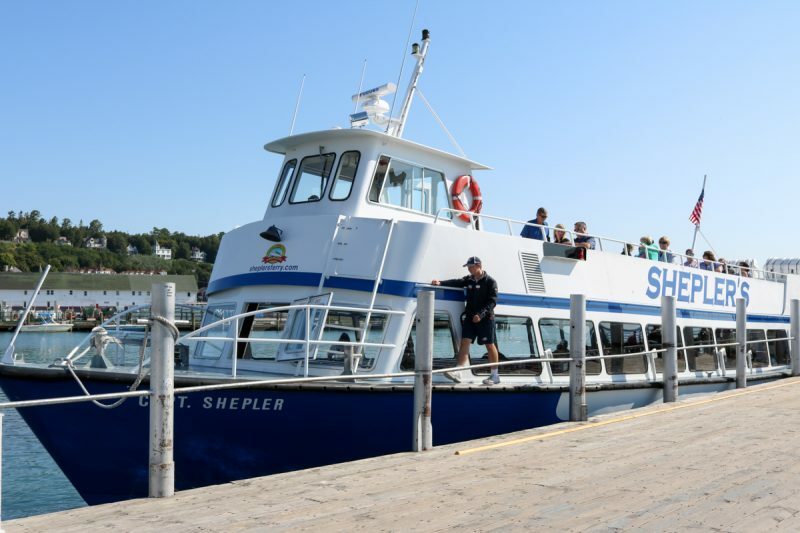 After an excruciating 15 minute ride, we safely arrived on a dock in Mackinac Island. I had to celebrate with a quick selfie. Dessa wasn't exactly in the mood to have her photo taken, but I couldn't blame her. 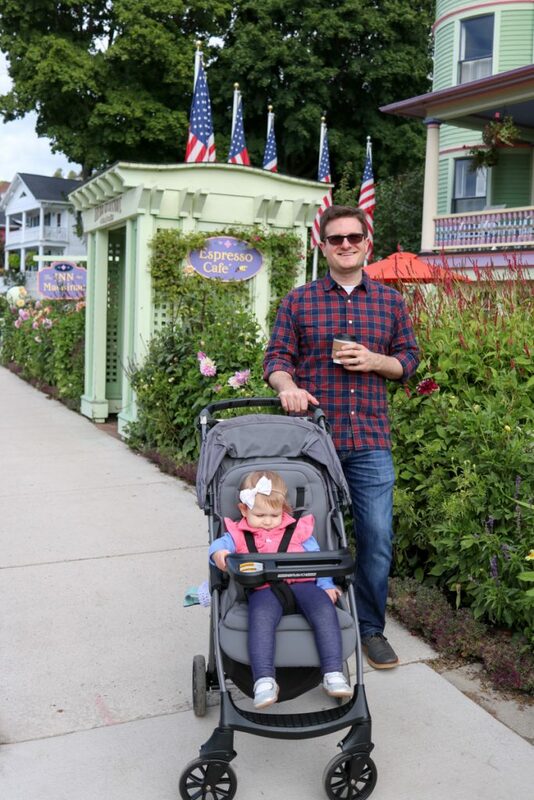 We arrived on Mackinac Island seven hours after we had left home and she was such a trooper for the entire journey. 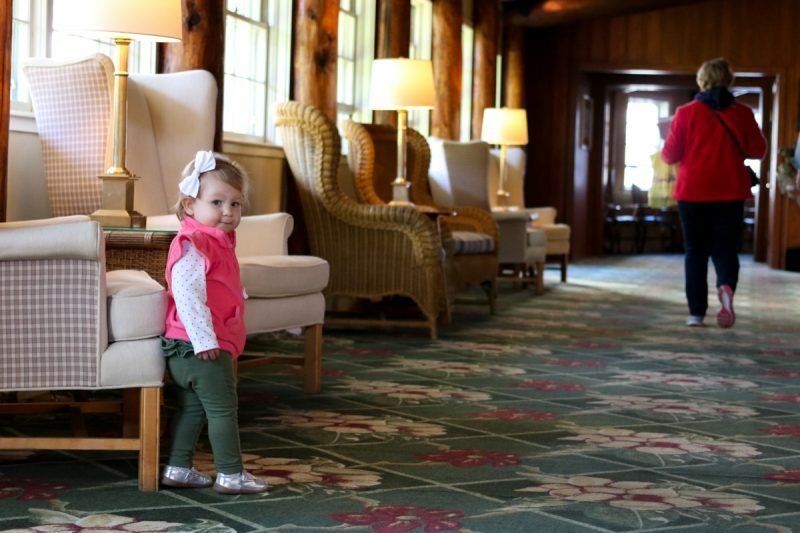 We took a horse-drawn carriage ride to Mission Point Resort and when we finally arrived at the hotel, I gave Dessa a chance to run around the lobby while Rob checked us in. 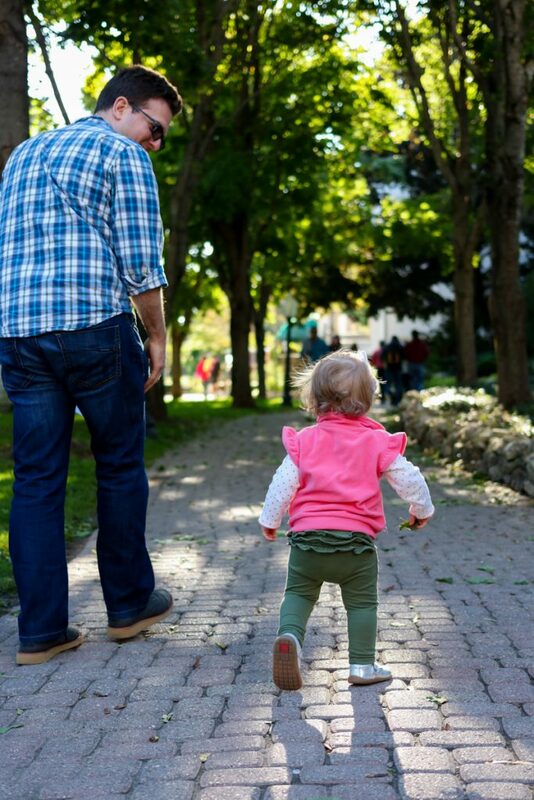 It was the first time Dessa's feet had touched the ground since lunchtime and she was ready to move! Dessa would have been happy to play in the lobby all night long, but we needed to find our room and eat some dinner. So away we went. 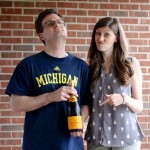 When Rob and I were planning for our trip to Mackinac, I spent a few hours researching the island's various hotels. 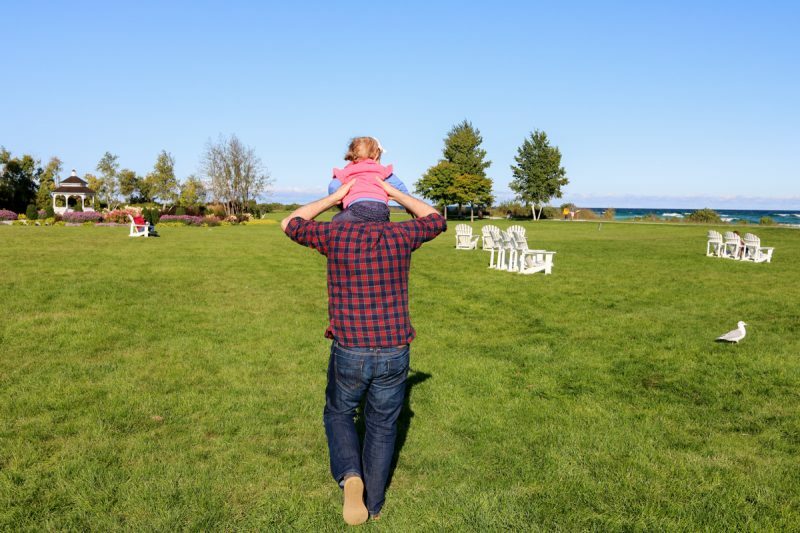 There were a lot of great options, but we ultimately selected Mission Point Resort because they are very family friendly and have extensive grounds. I knew that Dessa would love walking around on the property. Our room wasn't located in the main lodge. It was a little bit of a walk to the Straits Lodge but none of us were complaining. Thankfully, the ferry company handled all of our luggage and delivered all three pieces to the hotel for us. The bags were sent directly to our room and it was so nice to not worry about them while we took an adventure walk with Dessa. This just might have been the slowest walk we have ever been on. 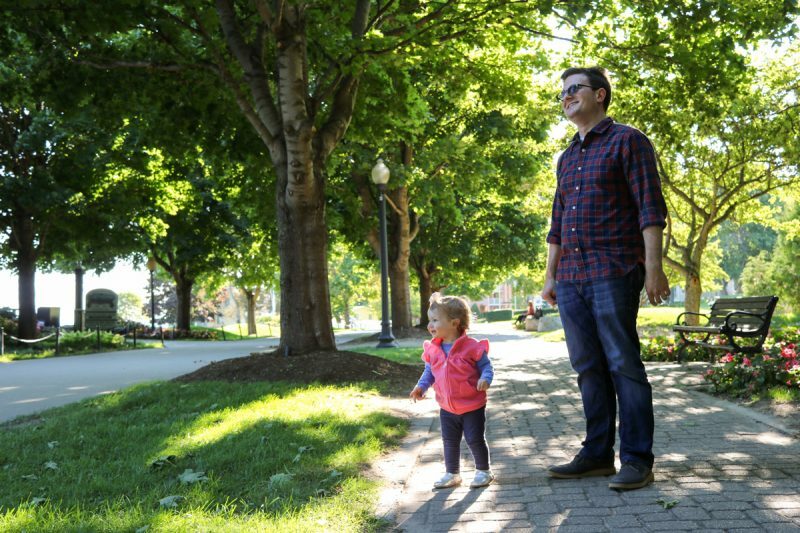 Dessa wanted to stop and examine every tree, flower, and rock that we passed along the way. 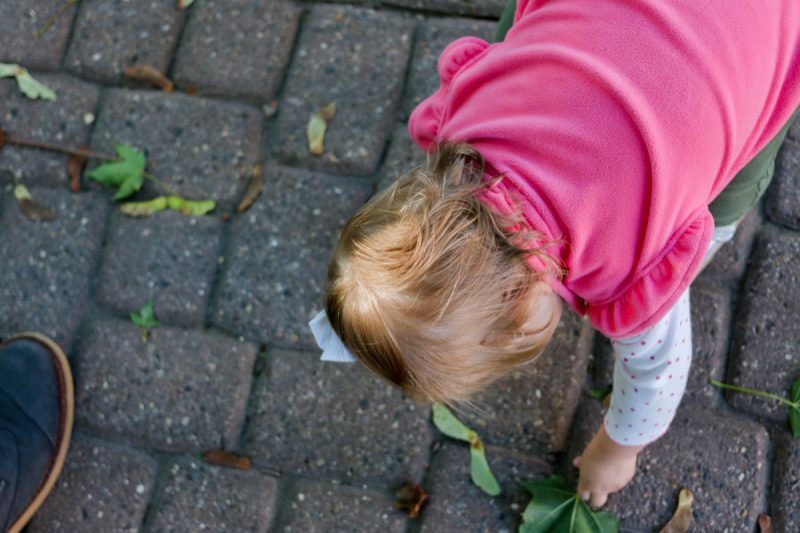 She also collected several leaves while we walked. This child was definitely in her glory. The rest of the evening was a complete whirlwind. We eventually made it to our hotel room, quickly unpacked, then left to grab some dinner in the main lodge. After dinner, it was time to head back to our room for Dessa's nightly bedtime ritual. 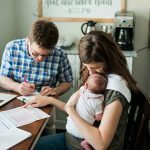 We stayed in a two-bedroom family suite, so that Rob and I could put Dessa down for the night and have a little time to relax without worrying about the lights and TV keeping Dessa up. 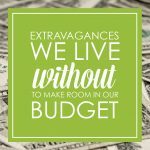 The suite was worth every penny because our little explorer slept long and hard – nearly 11 hours of uninterrupted bedtime sleep. It was magnificent for everyone. The next morning we enjoyed a quick breakfast at the hotel and hit the pavement for some family adventures. 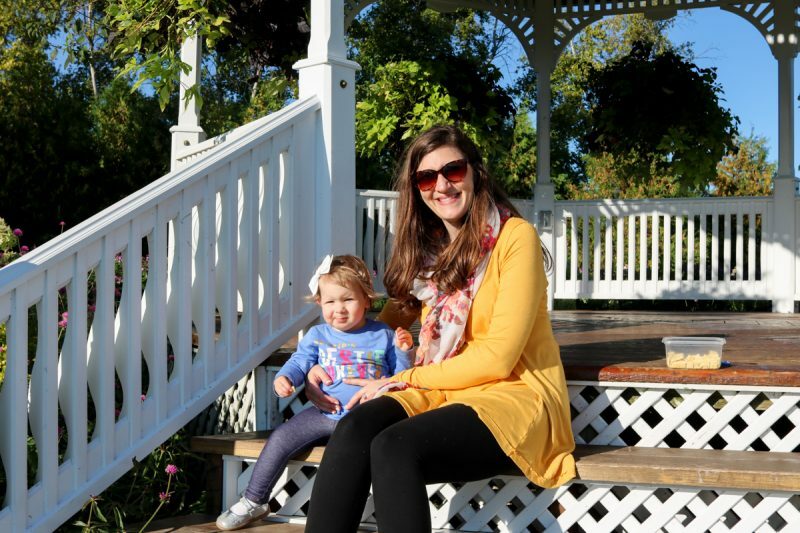 It was our only full day on Mackinac Island and we wanted to make the most of it. There was a lot to see and we needed a more efficient way of traveling than following Dessa on a make-your-own nature walk. We've been using the same full-size stroller ever since Dessa was a newborn. 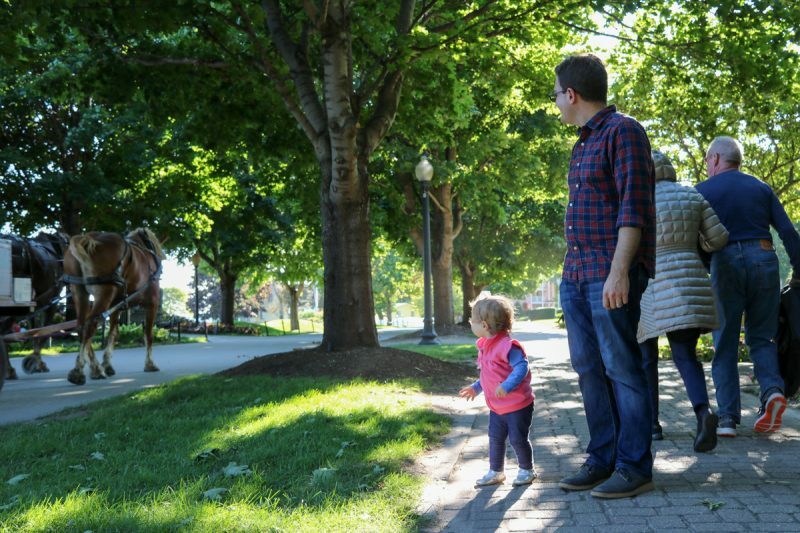 It's a great stroller, but it's a bit of a tank and isn't very travel-friendly. Our old stroller is bulky, heavy, and can be a bit of a workout to push up a hill! 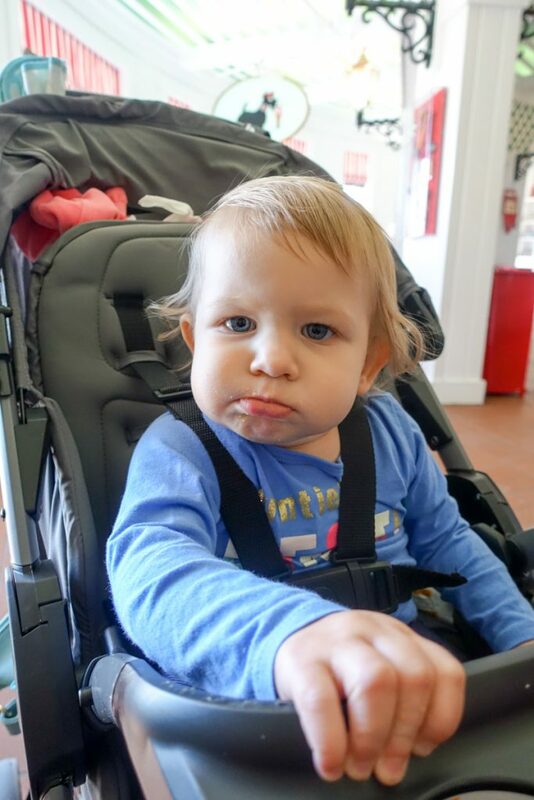 We were so thankful that Chicco sent us a Mini Bravo® Plus stroller to try out. 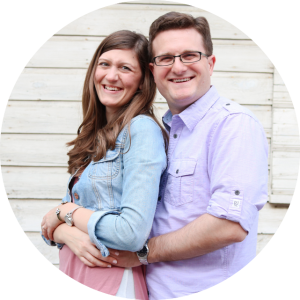 The stroller arrived the day before we left home – which was perfect timing for our trip! 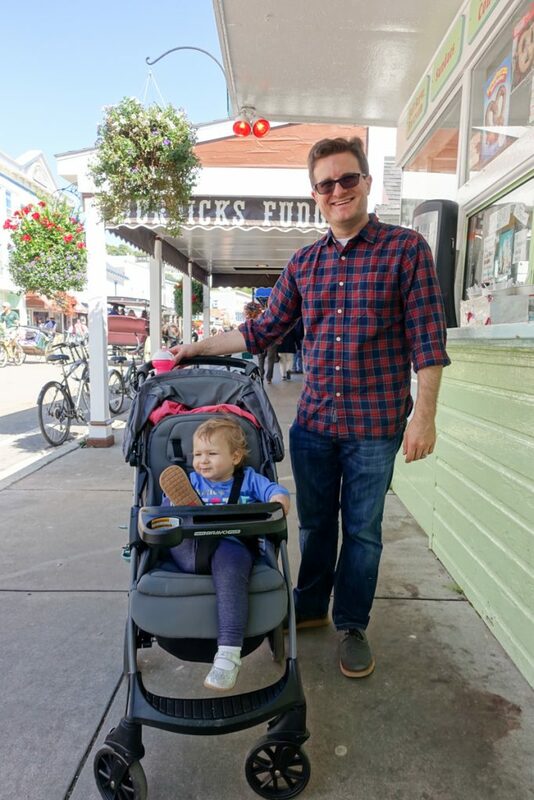 Even though Dessa hadn't sat in the stroller yet, we were already so pleased and impressed with it. It was easy to collapse, incredibly lightweight, and had a handle that made the folded stroller easy to carry with just one hand. 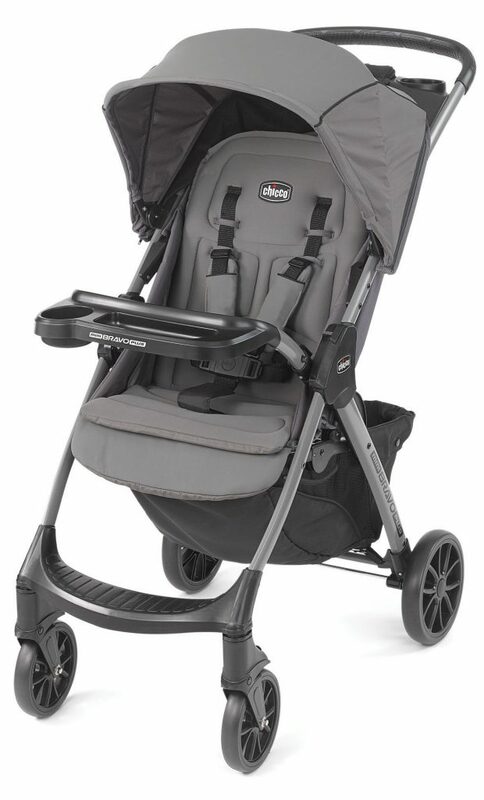 When we started researching lightweight strollers, I was worried that we might have to sacrifice some of the conveniences of our full size stroller – things like a snack tray with cup holder for Dessa, a parent tray with storage and cupholders for us, and the ability to store extra cargo under the seat. 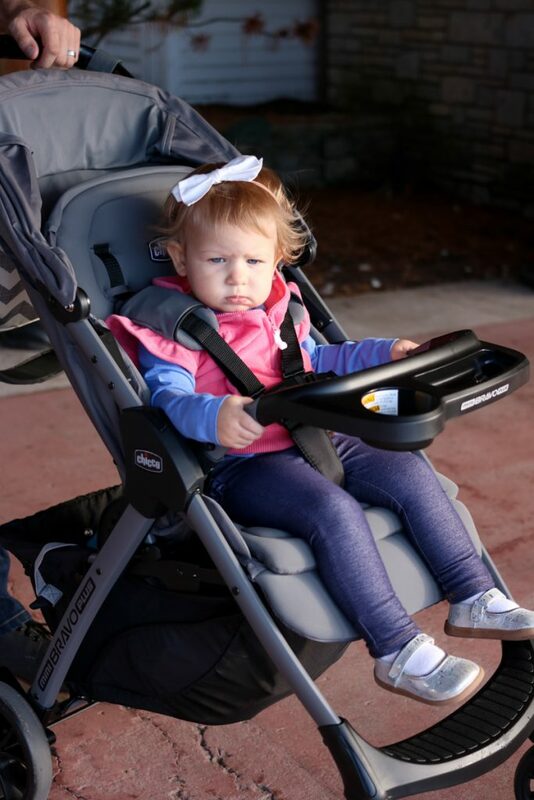 Thankfully, the Mini Bravo® Plus came with all of the same features we loved about our old stroller – without the extra bulk or weight. We brought the stroller with us on the ferry and used it to push the camera bag, diaper bag, and a few other items we didn't want to “check” with the rest of our luggage. The stroller certainly served as a helpful push cart when we arrived on the island Sunday evening, but on Monday we were ready to use it for its intended purpose – carting Dessa around the island with ease. Don't mind Dessa's grumpy face. She slept great all night but was somehow still tired after breakfast. Once Dessa was strapped in, we were ready to roll. I couldn't help but stop for a quick photos of the gorgeous view from the hotel. Dessa didn't mind sitting in the stroller, but she didn't like it when we stopped moving. And there's the reason why. She was still so incredibly tired. Dessa usually takes a morning nap, but Rob and I decided to power through and go for a walk in the hopes that she would pass out while we were walking. The seat of her stroller reclines into three different positions so she could comfortably get some rest while we walked. We crossed our fingers and hoped for the best as we set off. 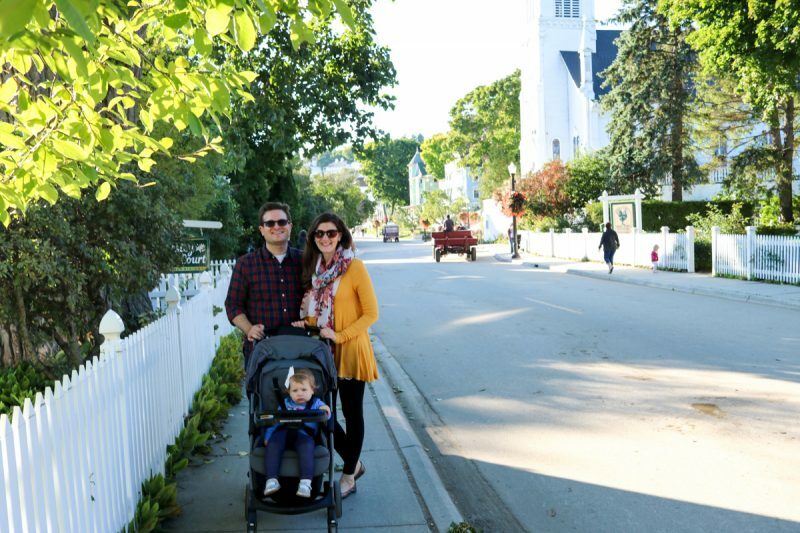 Mackinac Island's Main Street really is the quaintest little street ever. It reminds me so much of Stars Hollow from the Gilmore Girls. Dessa was definitely still tired, but she refused to give in and get some rest. After strolling down Main Street, we kept on walking and found ourselves with a gorgeous view of the water. We were also getting close to the Grand Hotel. 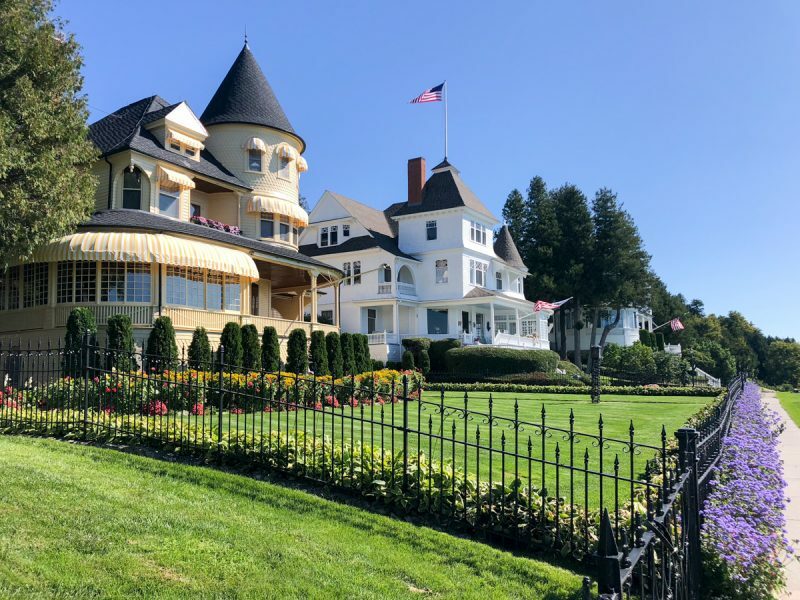 Rob and I stayed at the Grand Hotel for Halloween Weekend a few years back and the trip was magical (in so many different ways than this trip to the island). Seeing the Grand Hotel brought back so many happy memories. 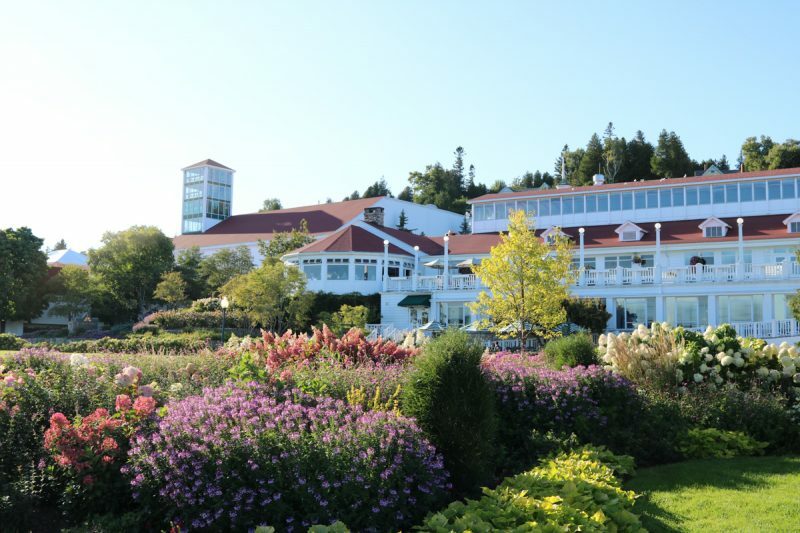 The Grand Hotel typically charges visitors who aren't staying at the hotel $10 to enter the hotel and walk on the grounds. I know it sounds crazy, but the hotel is kind of famous. 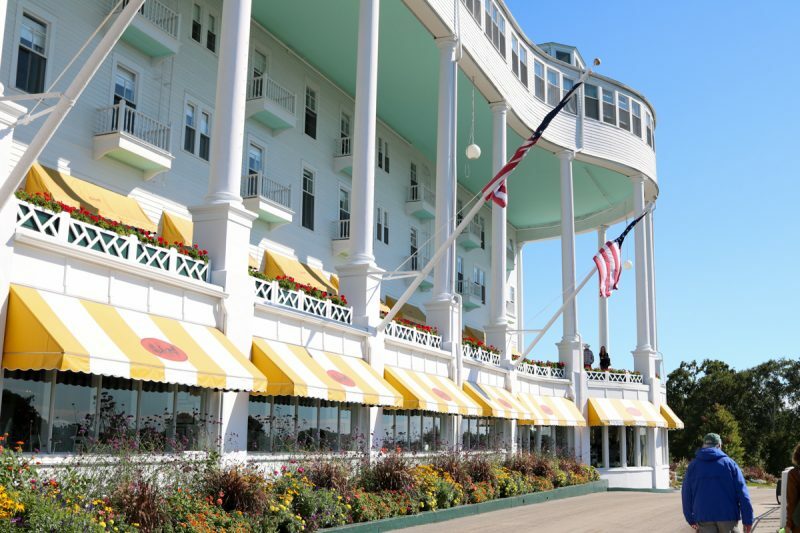 It has the world's longest front porch and the movie Somewhere In Time was filmed at the hotel. The movie makers even got special permission to have cars on the island during filming. The decor is also completely unique and the grounds are gorgeous. Visiting the hotel would be a perfect activity for a rainy day on the island. 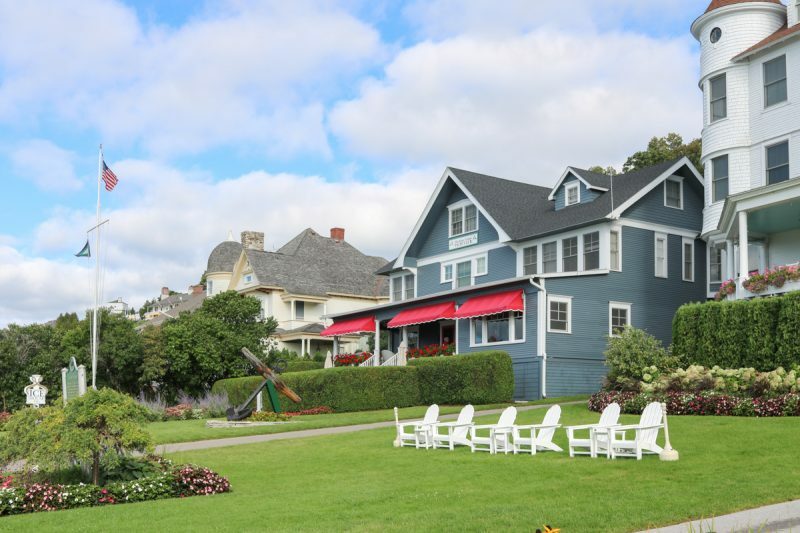 You could bring the family, spend some time on the porch, explore the hotel and stay for lunch. You could also pay for admission to the pool on a beautiful summer day. We didn't have plans to visit the hotel (this time), but we heard that a friend has a family home on the bluff past the hotel. 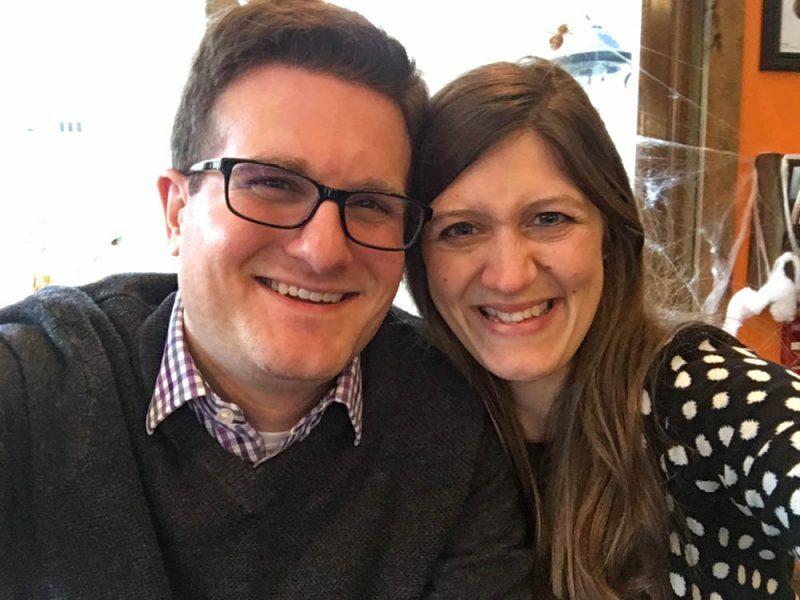 We did a little name dropping and said we were visiting her family cabin to get past the hotel without being charged and we went on our merry way. Dessa had a little snack while we travelled. 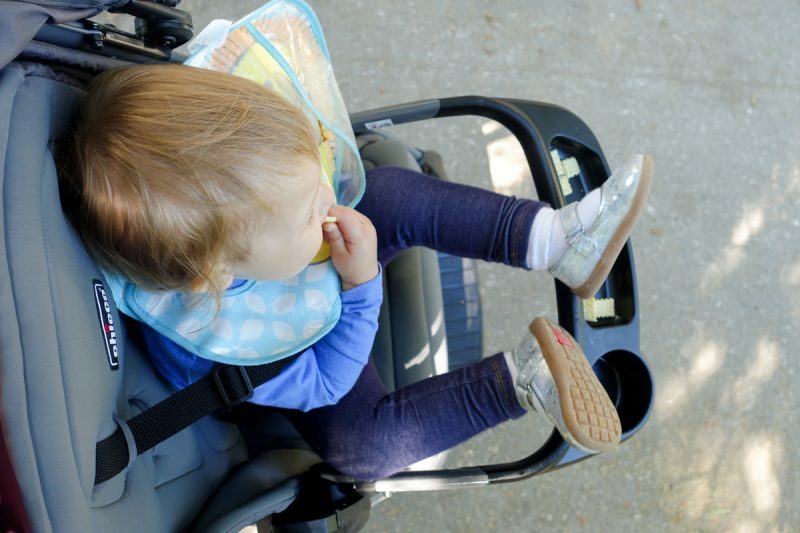 The stroller had a convenient little snack tray, which Dessa apparently thought was the perfect place to kick up her feet and relax. Whatever kept her happy! We finally made it to the houses on the bluff and, oh my, were they ever gorgeous! 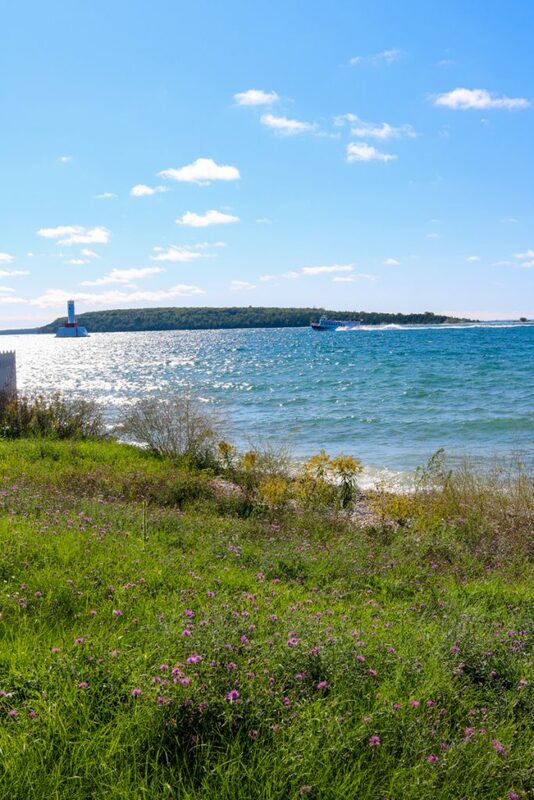 I've been to Mackinac Island several times and this is one little piece of the island that I had never seen before. It was definitely worth the long walk! Just in case you're curious about the value of these homes, we found the yellow one listed on Zillow with a price tag of $5.8 million. I couldn't begin to know what to do with that much house, but it was fun to fantasize about while we walked. 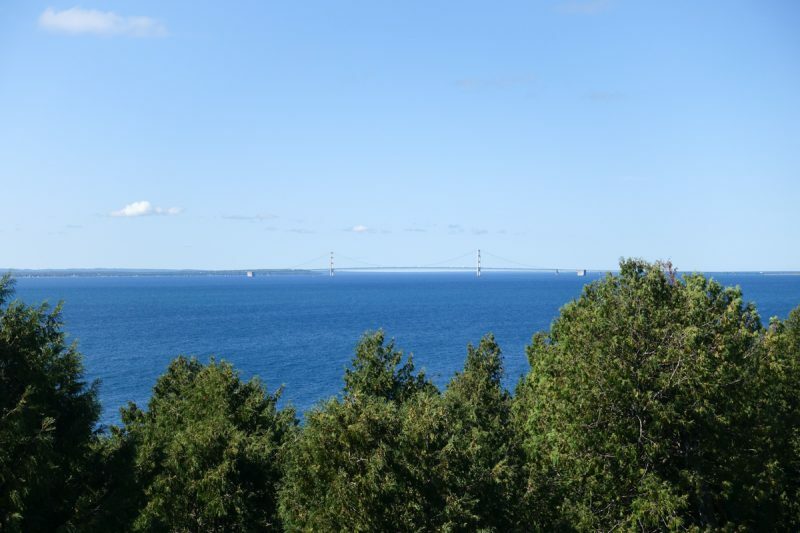 The three of us stopped for one spectacular view of the Mackinac Bridge before turning around and heading back. 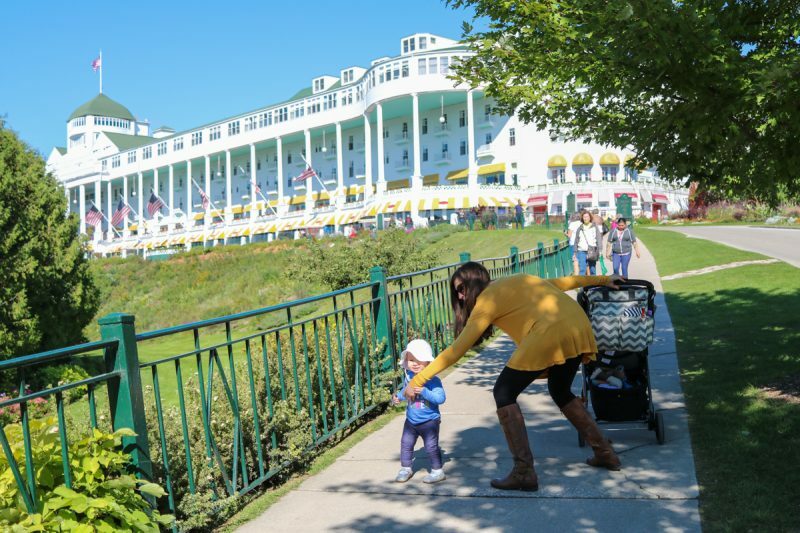 By the time we circled back near the Grand Hotel, the temperatures were starting to rise and our family needed a break. 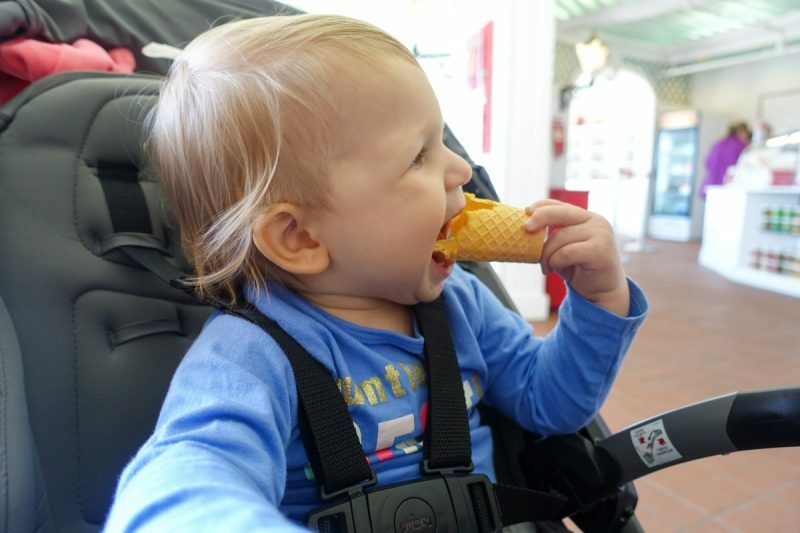 A quick ice cream treat at Sadie's Ice Cream Parlor was the perfect way to relax and cool down. … and then looked confused when it was gone. After our break, we slowly made our way down Main Street and back to the hotel. Everyone was in a good mood after enjoying a little treat, but we still needed to have a more sensible lunch. 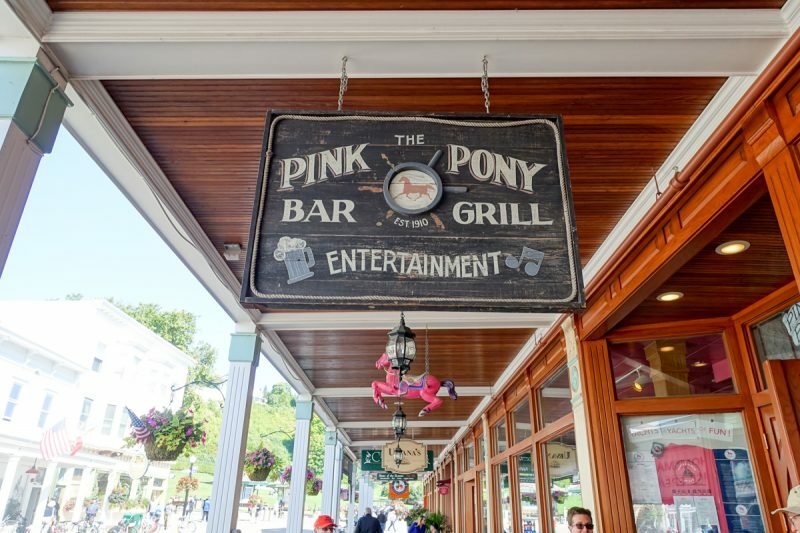 Before we left on the trip, several followers on Instagram recommended that we eat at the Pink Pony while we were on the island and this felt like the perfect time! The decor was funky, the music was fun and the food was delicious. They also gave Dessa a small pack of crayons to play with, which helped keep her entertained while we waited for our food. I realized after we were seated that the restaurant had three distinct atmospheres. We sat in the bar & grill side, but they also had a more upscale dining area with a gorgeous view of the water, and outdoor patio seating. 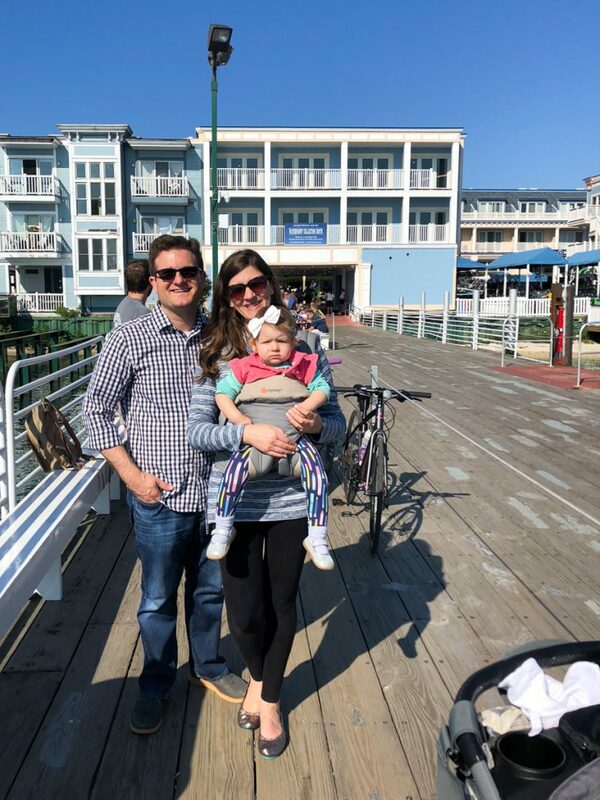 Dessa was a little bit feisty after skipping her morning nap, so I'm certain this was the perfect side for our family to have lunch, but next time we visit the island, I have big plans to enjoy a meal on the waterfront! 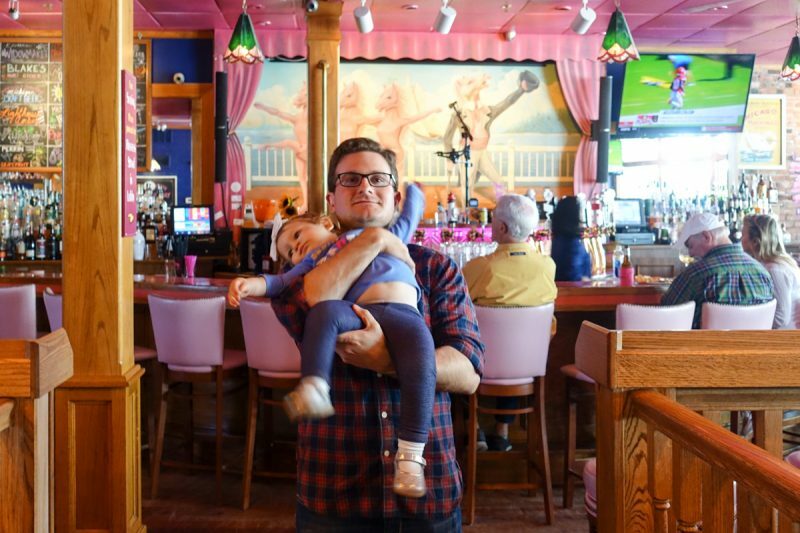 The restaurant had a funny mural of dancing pink ponies above the bar and I really wanted a family photo of the three of us in front of the mirror before we went. I took a quick test shot with my camera before we called over the waitress and this is how it turned out. Needless to say, we didn't get that family photo. Dessa was done and it was time to go. 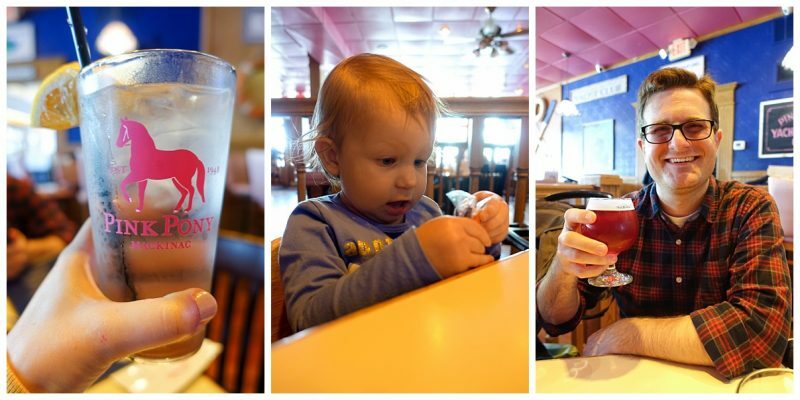 We paid the bill, popped Dessa back in the stroller, and high-tailed it back to our hotel – where Dessa proceeded to nap for nearly three hours. When she finally awoke around 5pm, we headed right back outside for more fun. We did a lot more exploring on the Mission Point grounds. 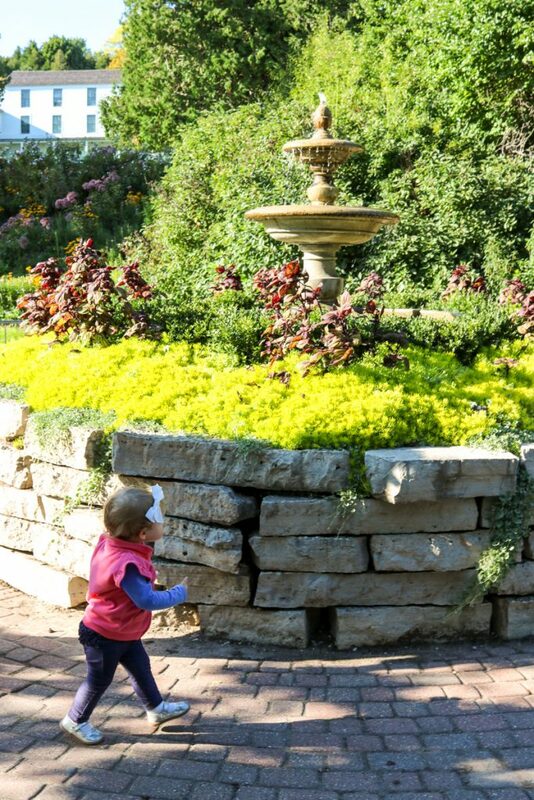 First up: running in circles around the fountain. And then something caught her eye. There was only one thing on the island that could make Dessa's face light up with so much joy. 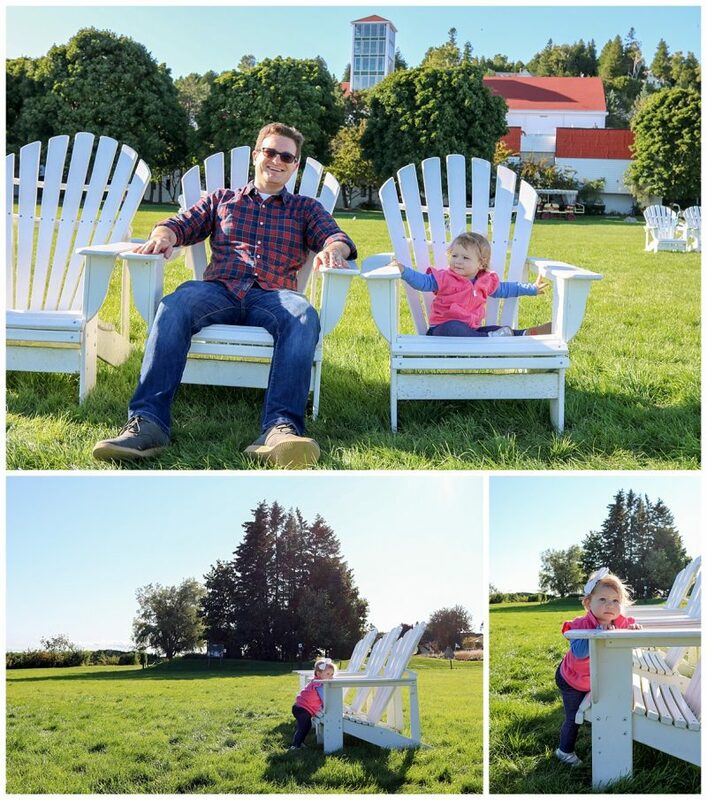 Once the horses passed us by, we took a little stroll to Mission Point's great lawn, which had dozens of Adirondack chairs overlooking the Straits. Dessa loved the chairs and was in seventh heaven. We slowly moseyed our way over to the gazebo and enjoyed a little snack (and a great view) on the stairs before making our way back downtown. The beautiful day was turning into a gorgeous evening. 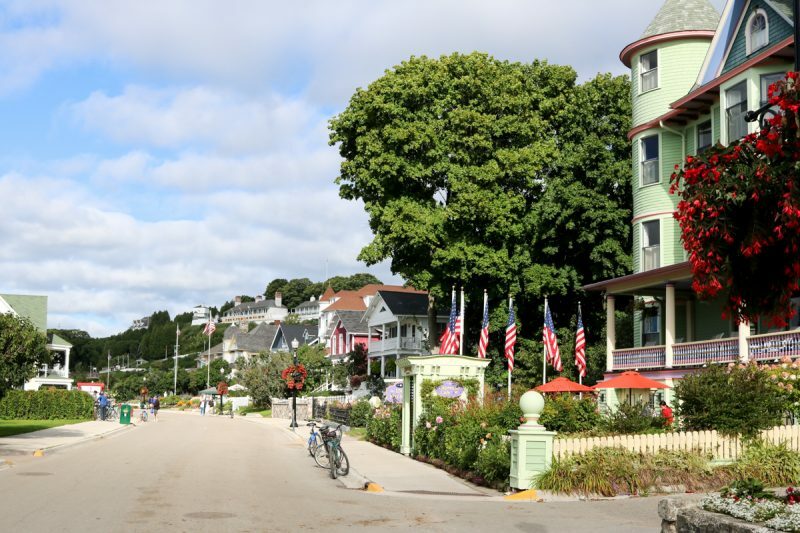 We hightailed it back to the other end of Main Street – almost all the way back at the Grand Hotel. 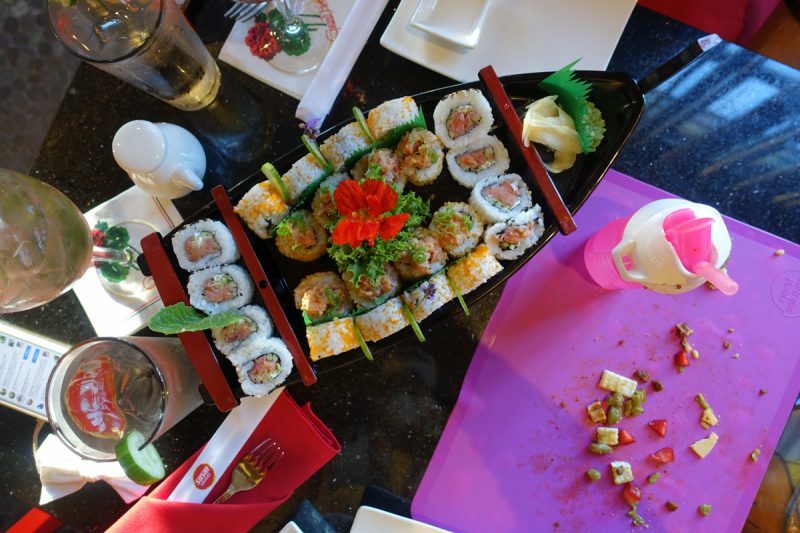 We treated ourselves dinner at Sushi Grand (a Grand Hotel restaurant located off-site) for a delicious sushi for dinner while Dessa enjoyed the spread of finger foods we brought along for her to eat. 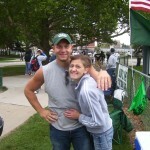 By the time we were ready to head back to our hotel, the temperatures were dropping. 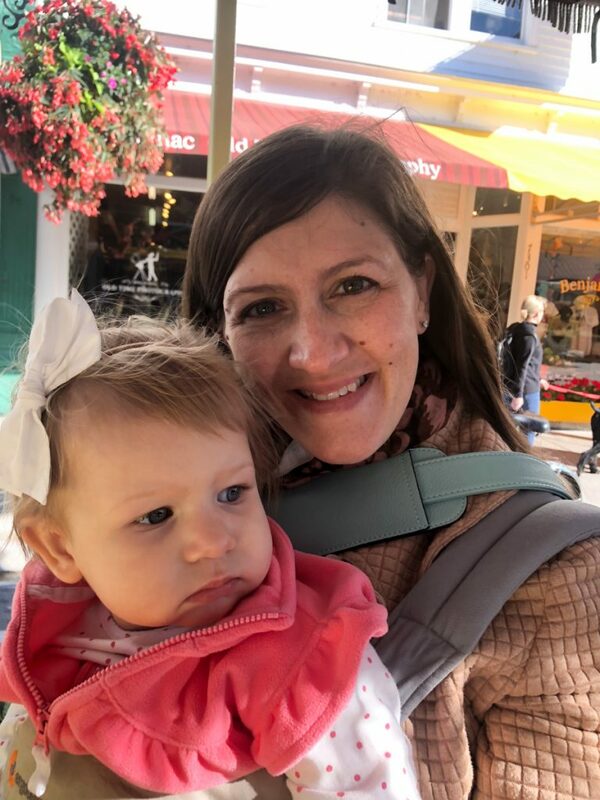 I gave Dessa a ride in our Ergo360 baby carrier and draped a poncho over the two of us for a cozy walk back while Rob pushed the stroller. 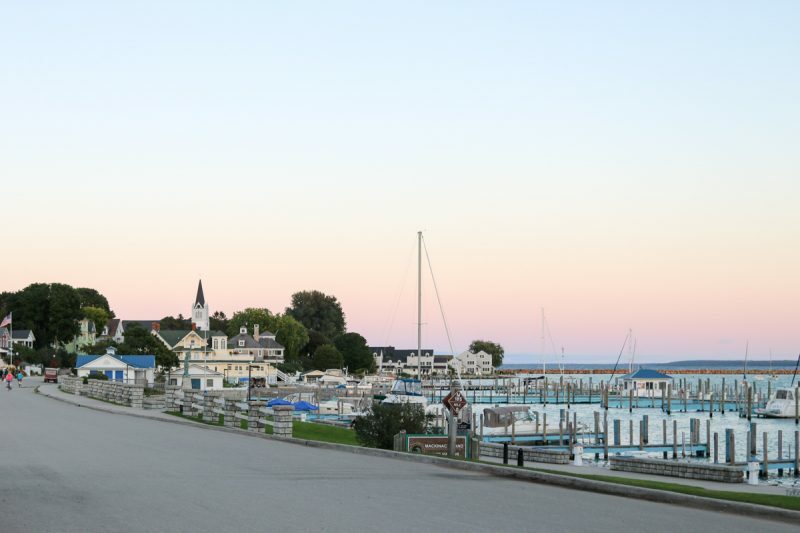 It was a magical end to a wonderful day on Mackinac Island. We got back just in time for Dessa's bedtime snack and a few stories. Then it was lights out for Dessa and a little quiet time for Rob and I. We couldn't believe it when our little adventurer slept like a rock for eleven hours again on the second night. The next morning it was time to get ready for home. We had breakfast and packed our bags, then made arrangements for our luggage. The only thing left was for the three of us to load back onto the ferry for the trip back to our car in Mackinaw City. It was shaping up to be another gorgeous day on the island and we didn't want to say goodbye. Thankfully, the water was much calmer this time around. 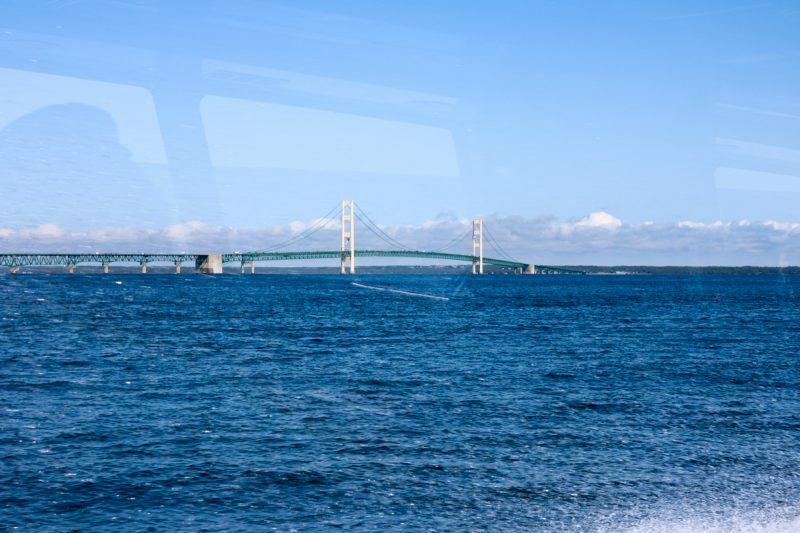 We enjoyed one last look at the Mackinac Bridge on our ferry ride back to Michigan's lower peninsula. I'd say our first family vacation was a success! We had perfect weather, ate delicious food, got plenty of exercise, and every member of the family slept incredibly well on the trip. The only thing I would do differently next time is stay an extra night. 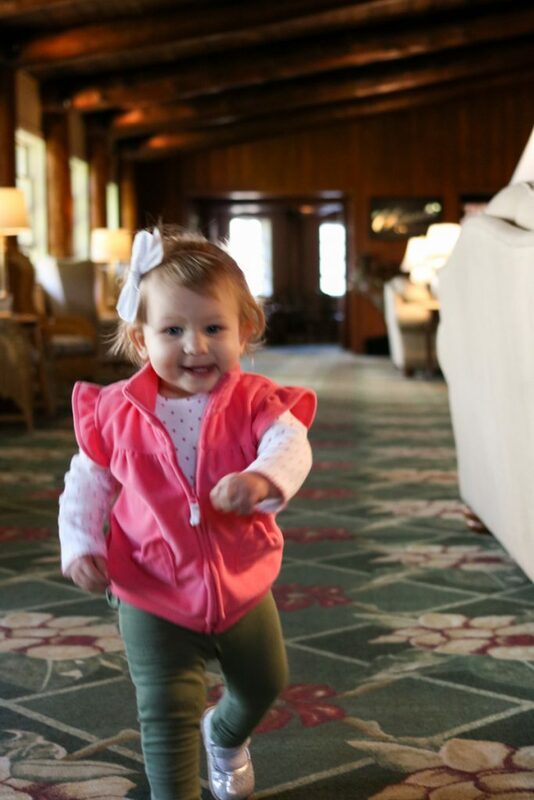 I really wanted to take Dessa for a bike ride around the island, hike up to Arch Rock, and let her explore in and around the Grand Hotel. 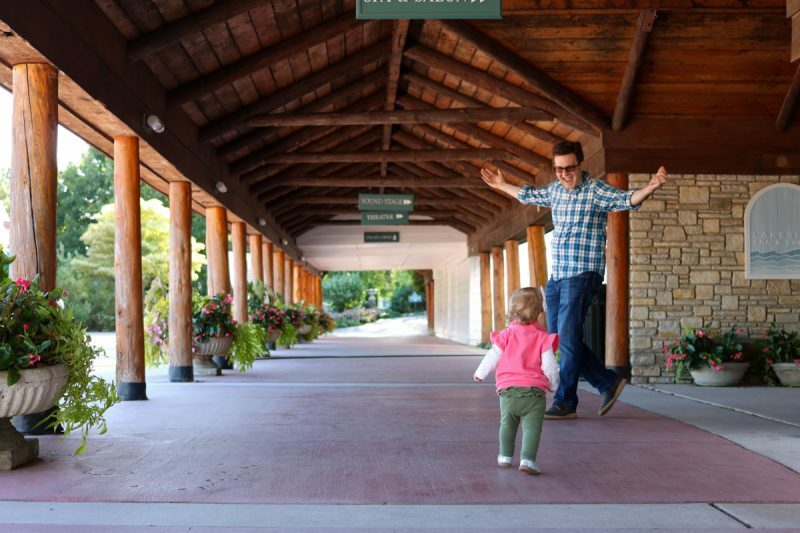 A two-night stay just wasn't enough time for all the fun we wanted to have. 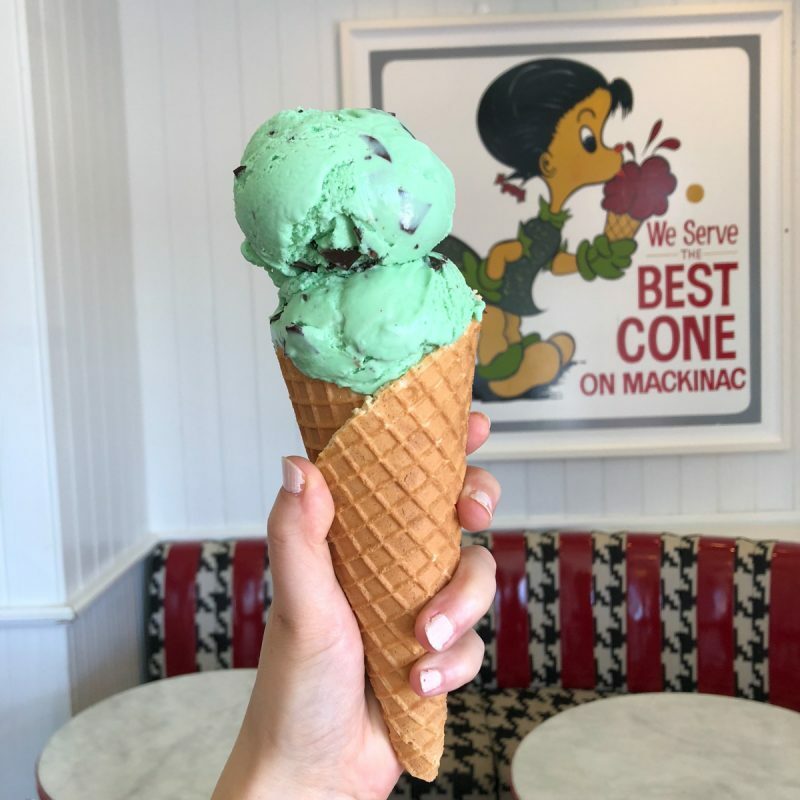 I'm already planning ahead for our next trip to Mackinac Island. One thing I do know for sure – we will definitely be sure to visit the island in mid-September again next time. The weather was perfect and there weren't any crowds. 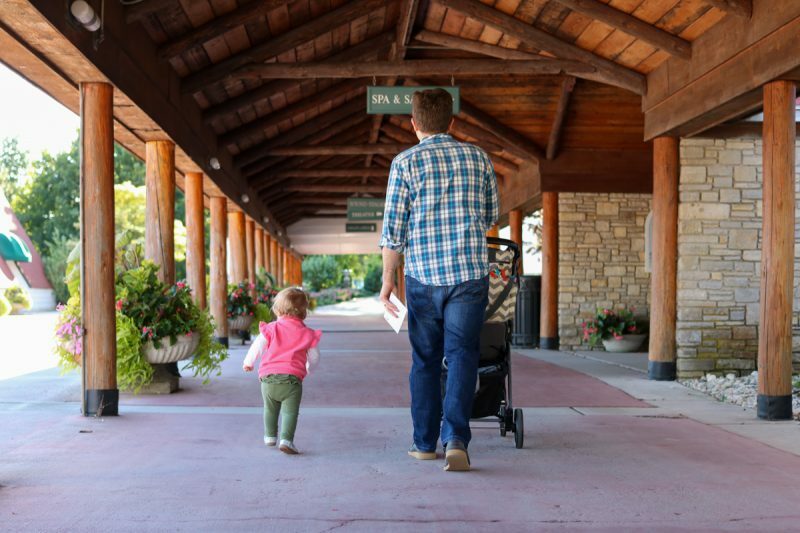 A huge thank you goes out to Chicco USA for providing us with a Mini Bravo® Plus and making all that walking a breeze! Love her expressions. So glad you had a great time.